I love this recipe from The Healthy Chef, Teresa Cutter. All the ingredients go into one bowl and are mixed to make a lovely cake. The cake uses almond meal which means that it is gluten free and high in protein. 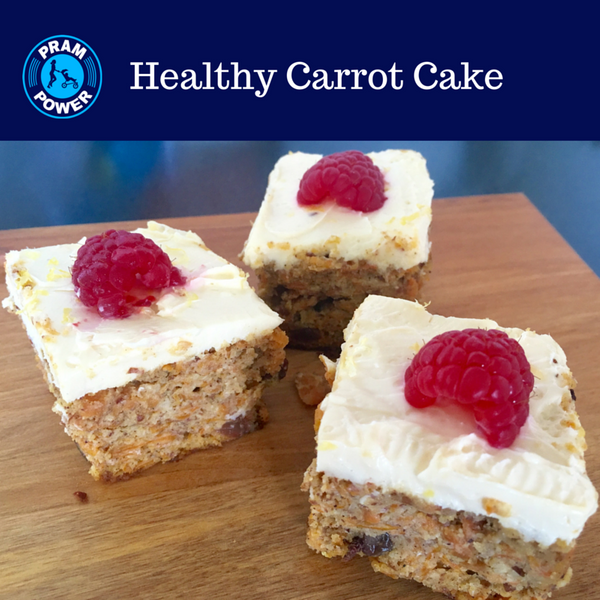 The recipe packs in 500g of carrots, which is a great source of vitamin C, B6, potassium and fibre. It is naturally sweetened with maple syrup and raisins. I usually top the cake with a cream cheese icing (see below) and garnish with a raspberry or walnut. Preheat oven to 160 C. Mix all ingredients in a bowl until well combined. Pour into a prepared 20 cm baking tin (round or square works) and cover with foil. Bake for 1 - 1 1/2 hours or until cooked through. Remove from the oven and allow to cool completely and then turn out. Ice (if desired) and cut to serve. Cream Cheese Icing - Blend a 250g block of cream cheese with lemon zest, lemon juice, and maple syrup to taste (I start with half a lemon and 1/4 cup of maple syrup).